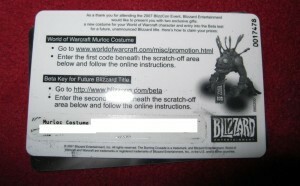 Please take a look at our fantastic auction items! A few of these items will be given away as raffle prizes throughout the weekend, though we’re not announcing which, or when, so you’ll need to tune in! From Uber Entertainment’s hit game, Monday Night Combat, we have several high quality statuettes of the game’s characters. 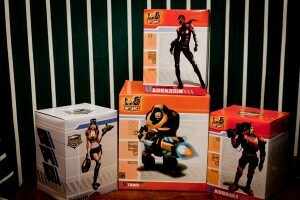 Pictures and auction info will be updated once we pick these up from Uber, on Thursday. A $280 value! 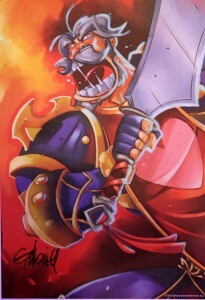 This is a 2007 limited edition World of Warcraft print of Leroy Jenkins, drawn and signed by Mike “Gabe” Krahulik of Penny Arcade. We’re dropping these off at Penny Arcade, and will post the auction once we have signed copies! 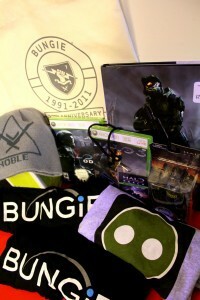 The Bungie bundle includes a 20th anniversary bag, a Halo art book, Halo 3, Halo 3: ODST, Halo Reach, a Spartan action figure, a Noble Team beanie, and Bungie t-shirts. The Harmonix swag bag is new and includes: Beatles Rock Band (game, no instruments), Rock Band 2, Rock Band 2 country track pack, a Rock Band hat, a rare Rock Band: Bar Nights t-shirt, a Dance Central Scarf, a Dance Centra bag, 4 different colored Dance Central 2 slap bracelets, Dance Central 2 moves bandana, 2 Rock Band wrist sweatbands, 1 microphone pin, 2 Beatles Rock Band Xbox Live avatar shirt codes, 19 Rock Band stickers. 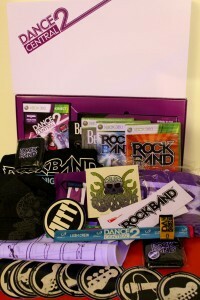 The Dance Central 2 Media Kit is new and includes: Dance Central 2 (game, no Kinect), a dance central VIP lanyard with 1 month Zune pass, 12 month Xbox Live pass, and a 1600 Microsoft points pass (used), Dance Central moves flash cards, 2 Dance Central paper pads. All personal media information has been removed. 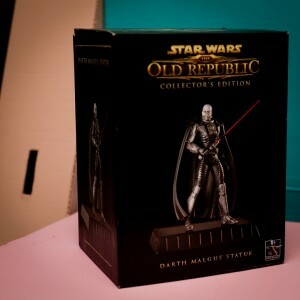 This is a high quality statue of Darth Malgus that came with Star Wars: the Old Republic Collector’s Edition. Isn’t this what you’ve always wanted? 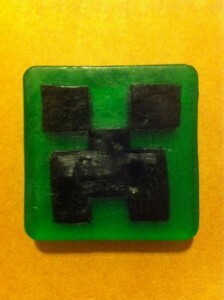 Creeper soap! Made from glycerin, comes in a pack of three. Creeper dice bags! 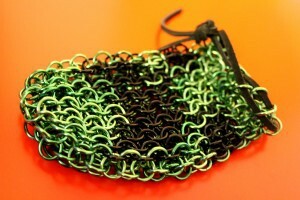 Made of chainmail, in the style of the infamous creeper, and designed to hold all of your gaming dice. 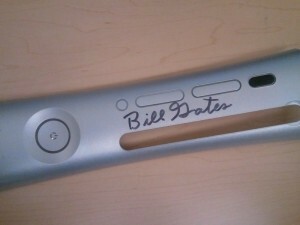 A silver, Xbox 360 faceplate signed by Bill Gates, founder of Microsoft. This item was sent and verified by a Microsoft employee. Impress your friends with this epic loot! Jones Soda and Mojang have partnered with us to bring you Minecon-exclusive Jones Soda packs! Additionally, we are getting coupons for free myJones so that you can create your own custom labels and bottles! Please note that we’ll only have access to the standard Minecon flavors, not the special ones such as the Volunteer edition. SamCube over at WonderCraft has been doing some amazing Minecraft-inspired art, and now you can have your character drawn in this style! Only two will be made, so follow us throughout the weekend! 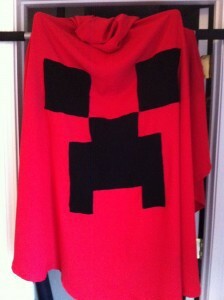 This is a high quality, handmade, one of a kind, hooded creeper cloak. One size fits most adults! 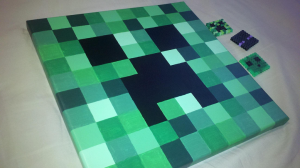 Check out this awesome 12″ x 12″ creeper painting! Also includes a creeper, enderman and slime magnet! 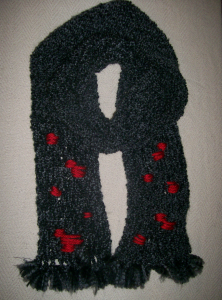 This is a one of a kind stone and redstone scarf. 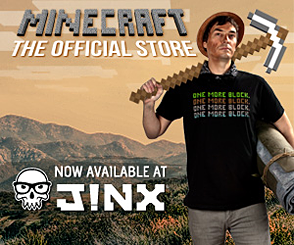 Get fashionable with Minecraft! 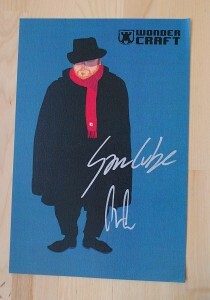 This is your chance to bid on a super limited edition print, signed by SamCube and Notch! 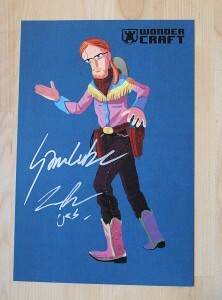 This is your chance to bid on a super limited edition print, signed by SamCube and Jens!